Circulation is the process of your heart pumping blood through your veins. As the blood circulates, it delivers good oxygen and nutrients to the body’s cells and gets rid of excess waste in our system. Good vein circulation is vital in preventing vein disease and maintaining health for your entire body. Feet falling to sleep, zapped energy, bloating, fluid retention, edema and swelling of the legs and feet and embarrassing spider veins and varicose veins. When you suffer from poor circulation it can lead to pain and discomfort of the legs and feet, even severe venous ulcers. EXERCISE - includes many activities – just choose ONE, and have FUN doing it!! Another good remedie is to Flex your FEET- stand on your toes and flex the heel up and down – do this off and on during the day – it helps stimulate blood circulation in your legs. Get a MASSAGE - which can stimulate and speed up your body’s blood circulation. The pressure you receive from the massage can move your blood through areas that may be congested where the blood is not flowing properly. The pressure and motions of a massage helps flush “metabolic waste” from your muscles and internal organs, which can lower blood pressure and provide better circulation and everyday body function. Plus getting a “massage” just feels good - helping relax your thoughts and tension, taking a lot of stress and discomfort off your tired body. Drink lots of WATER - Yes you have heard this all your life…it’s TRUE – Drinking enough water everyday can help combat circulation problems, plus helps flush out bad toxins in our bodies. AVOID – a lot of caffeinated and alcoholic beverages. You will feel a major difference in how your legs feel and increase blood circulation of the legs and feet. Avoid sitting long periods of time – If you have a desk job – check your seat. Make sure your seat is not too deep, meaning your feet does not touch the floor. This is not good, the front edge of the chair can dig into the back of your legs, compressing blood vessels and restricting blood flow. Get a chair that fits your body better or Get a FOOT REST to bring your legs off the edge of the chair. Also AVOID crossing your legs. Sitting with your legs crossed can slow leg circulation to and from your lower legs where a lot of vascular problems start. Wear Compression Stockings or Socks - Compression Stockings are elasticized hosiery that promotes blood circulation by putting gradient pressure / gentle squeeze on the veins. This improves the flow of blood back to the heart, reducing swelling, tiredness and the aching of the legs and feet. 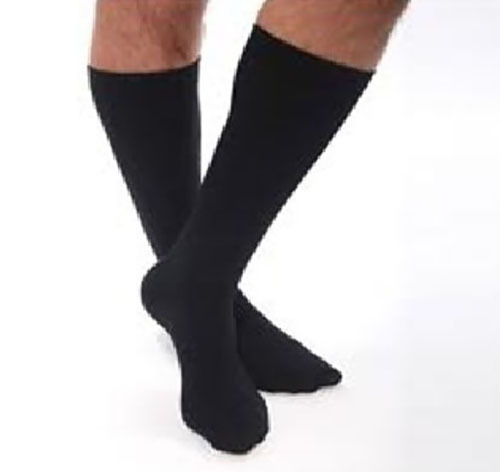 You do not need a prescription to buy compression stockings or socks. You can buy them online. We have Certified Fitting Specialist waiting to Help provide you with a proper fit and answer any questions you may have. Call us at 1-844-629-9642. For Today’s For the Man on the Go! Be Good to your Legs. They carry and support us every day of our life. Follow these above tips to ensure healthier body and legs - Naturally! !